Block 9 is in the heart of downtown Fargo at the corner of Broadway and Second Avenue North. It’s a front row seat to next weekend’s St. Patrick’s Day Parade. It’s in the wide shot of ESPN’s College GameDay. It’s center aisle of the Fargo Street Fair and the myriad community events that call downtown Fargo home. And it’s currently a 48,000 square foot surface-level parking lot. Block 9 has captured imaginations of people around the world as the metro community and Kilbourne Group set out to dream of possibilities for the property. Held in 2010, Downtown Fargo: An Urban-Infill Competition garnered 160 design entries from 23 countries. Six years later, a strong partnership has formed to turn the dream into reality. With a mutually beneficial public-private partnership, this empty slate will be transformed into a mid-rise, mixed-use tower that will add to a vibrant city core and change the skyline of downtown Fargo. It has the potential to provide at least $50 million in new taxable property, according to the City of Fargo’s Renewal Plan. The project includes corporate headquarters for hundreds of team members of RDO Companies, ground floor retail, an 88-key hotel, residential condominiums, a 350+ spot parking ramp and a reinvigorated public plaza. Adding a new center of commerce into the heart of downtown creates new unique experiences, and more economic activity in this core business district. Bringing additional people downtown will have a positive impact on the growth of the neighborhood, its merchants, restauranteurs, residents, visitors, and other stakeholders. The dreams carry over into the US Bank Plaza as a potential community gathering and celebration space. Inspired by public spaces such as the MainStreet Square in Rapid City, Block 9 designs include a public plaza which project partners envision to become a gathering and celebration space for the region. Early plans for the space include a seasonal skating rink, splash pad, and bandshell, and the opportunity to program countless new downtown Fargo experiences. The redevelopment of Block 9 aligns with the goals set in Fargo’s GO2030 plan to prioritize infill and quality construction. Through distinctive and thoughtful design, Block 9 will complement the Radisson Hotel, Black Building, Gate City Bank and other neighboring properties. 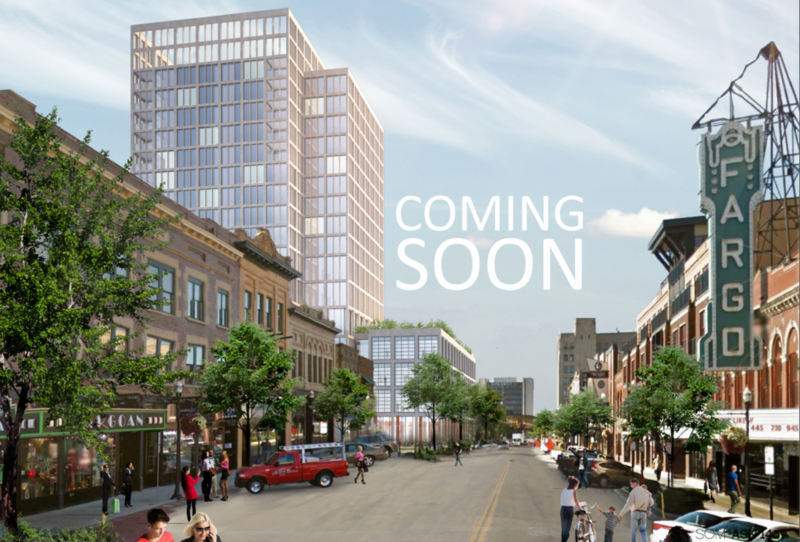 Skidmore, Owings & Merrill LLP has been chosen as the architect and Mortenson has been chosen as the contractor for this project. Ground breaking is anticipated to occur fall of 2016. Construction is estimated to take two years.